Well, my lovelies, this has been a long time coming. 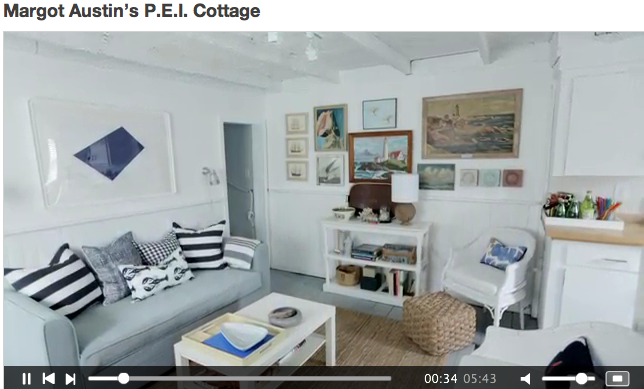 I mentioned in an earlier post the fact that I was not yet able to share images of our finished Whale Cottage on Prince Edward Island. You see, a magazine held the rights to the images taken last summer by the super talented Michael Graydon. It was my understanding that the magazine story would be published some time this summer. In good faith I did not reveal the finished space, expecting to see it in print. Mr. A was interviewed. Sources were submitted. Follow up questions were answered. But the feature did not run. Summer is drawing to a close. But I, for one, have not stopped thinking about peaceful sandy beaches, seafood feasts, bike rides and bonfires..and our little getaway on the East Coast. So...(gee, wish I knew how to find and upload a drumroll gif. I don't, so ellipses will have to do)....here, my friends, are the before photos, followed by a link to the Big Reveal. 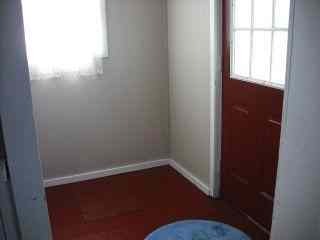 Entry vestibule before: red painted wood floors, white trim, tan walls, nasty polyester lace curtains. All ugly but the very existence of this space was a bonus - so great for rain gear, sports equipment and beach stuff. 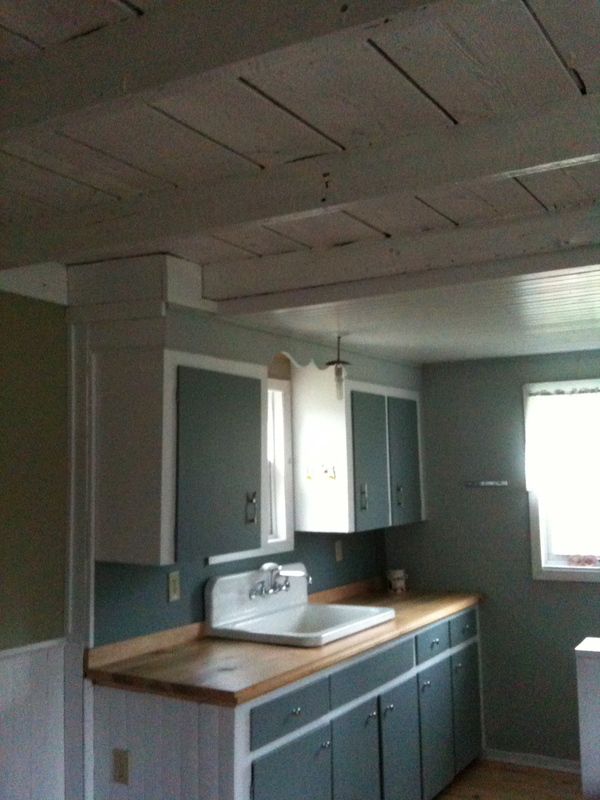 Living area before: loved the wood floors, tongue and groove wainscotting, beamed ceiling. Disliked the combo of paint colours and the missing door to the utility room, leaving the water heater in full view. Also, the space is teeny so I knew it would be a challenge to furnish. ...and a gander to the other side of the "kitchen" reveals in fact no appliances at all. Bummer. The utility area - I won't call it a room since it had no door - featured beige walls and a fetching shade of purple on the trim. That's right, purple trim. Oh yes, and knotty pine floors and no door (did I mention that?) and an exposed water heater. Nice. The bathroom, wedged under the stairs and off the utility area was just large enough to hold tub, toilet and this sink. No window. Some rust and mildew. A broken sink cabinet. No room to turn around. Eeeww. P.S. there's an eyeful of that purple trim. At the top of the stairs, the snug: loved the west light flooding this space when we saw it first in late afternoon. Yellow floors, no. Blue-grey wall colour, yes. The twin bed frame and table: scooped from the curb almost as fast as we put them there. The main bedroom: loved the angled ceiling, the beadboard on the ceiling, the gentle cross breeze between this window and the one in the snug across the way. This double bed frame fit in the Snug so we upsized to a fancy pillow top queen for this room to make it feel like a resort. Carpet: ick, gone. Vanity: to the curb. Space heater: in storage awaiting our first cold-weather visit.